This video shows the build of a Simple Woodgas generator for small electric RV generator.A wood gas generator is able to convert wood, or in our case, wood pellets, into a source of fuel which can be used to generate electricity.The wood or charcoal is turned into wood gas, which will be used for powering our generator. In this tutorial, we are creating a wood gas generator that can be used to power and RV motor.From start to finish, we were able to put together this generator in only four hours. In total, we used less than $100 in parts. It’s a great way to build your own wood gas generator while staying on a tight budget.If done correctly, you should be able to run your generator by burning wood pellets alone. It’s enough to power a small 5 hp electric generator, or even more. 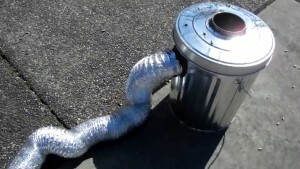 .The materials you need for this project are 20 Gallon Metal Trash can – This will be used to contain the wine cooler and wood chips as they burn,Wine Cooler – This will encase the wood chips as they are burning,Metal Bowl – You will place the wood chips in this bowl and collect the coals as they burn.Filter – This will filter the tar out as it makes its way to the generator,Wood Pellets – Our fuel source.Aluminum Duct Line – This will connect to the gas generator to the wood pellet burning stove.Air Inlet Port – A valve that we can use to let air in as the wood gas travels to the generator.